Makati City, Philippines - Preparing a feast for our Friends and Family this festive season can be stressful because preparation can take a long time thus less time to bond with them. But make your celebrations easier this festive season with Apag Marangle. With the name literally means 'Dining in the Farm’ or ‘Hain sa Bukid' in Tagalog, Apag Marangle serves authentic Kapampangan food in a farm setting which gives it a laidback ambiance. Everyone can enjoy a eating authentic Kapampangan food complete with traditional Kapampangan music to accompany their experience. Located at Park Square, Makati, Apag Marangle boasts of home made Kapampangan food that is packed on flavor using only the freshest ingredients that come from their farm in Bacolor, Pampanga that you are sure that everything will be fresh and cooked to perfection this festive season. From the famous sisig Pampanga is known for, to one of a kind food made for the adventurous like Betute which are fried farm frogs filled with ground meat or sauteed crickets which is called Camaru in Kapampangan. For meat lovers, They have Humba or Pork braised in yellow paste that has a side serving of ripe banana that mellows the bold savory flavor of the pork. Another crowd favorite is Apag Marangle’s Kare Kare - or beef oxtail stew made with creamy peanut sauce served with Apag Marangle’s homemade fish paste. A must try for every foodie is Apag Marangle’s Nasing Marangle, A dish which has rice, meat, and vegetables that fits everyone’s palate. As this festive season is coming make sure to bring the whole family and your friends to Apag Marangle at Park Square Makati. Apag Marangle is open for reservations for upcoming functions like Christmas parties, family get together and reunions so make sure to go to Apag Marangle and get a taste of Kapampangan food this festive season. For more information to get reservations in Apag Marangle you can call them for reservations at 0915-241-2000 or visit them at Parksquare, Ayala Center, Makati City. 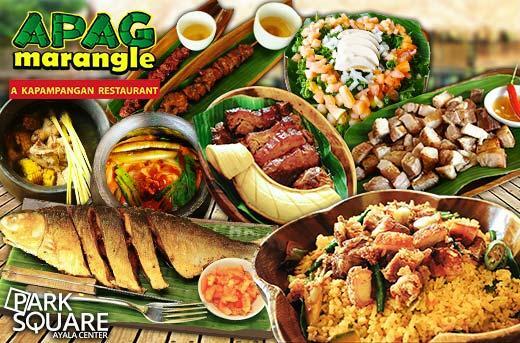 Mangan Ta Na this Holiday season at Apag Marangle!